The field of human genetics is moving at a tremendously fast pace, with the completion of the human genome sequence in 2003 and the resulting boom in the development of high-throughput technologies. This is accelerating our understanding of the role of genes in health and disease, and now expands beyond rare genetic disease to common disease. We are entering an era where sequencing of whole personal genomes is realistic, which will create a global impact on life science research and patient care. Prospects are that genetic therapies and personalized medicine will become part of common practice in the years to come. Retinal dystrophies are rare genetic diseases that can be inherited through autosomal dominant, autosomal recessive and X-linked mechanisms, and are characterized by an enormous genetic heterogeneity. In the past, genes for retinal dystrophies have been mainly identified by linkage analysis in large families and by candidate gene approaches. More recently, the use of high-throughput single nucleotide polymorphism (SNP) microarrays allows the detection of homozygous regions at a genome-wide level, which can be very helpful to detect new genes involved in the recessive forms, even in small families and isolated cases. In the last four years, high-resolution homozygosity mapping enabled us to identify a number of new autosomal recessive retinal dystrophy genes, including CEP290, LCA5, EYS, PDE6C, C2ORF71, and IMPG2. In the last two decades, molecular studies have revealed the underlying molecular causes in approximately two-thirds of patients with retinal dystrophies (Figure 1), and with the development of new sequencing technologies (exome and whole-genome sequencing) prospects are that this percentage will increase towards 80-90% in the next years. Figure 1: Prevalence of mutations in genes causing genetically heterogeneous retinal dystrophies. The tremendous progress in delineating the molecular bases of inherited retinal dystrophies, together with recent reports on the success of gene augmentation therapy for Leber congenital amaurosis caused by mutations in RPE65, provide great promise for future applications of genetic therapies to blindness. Many obstacles lie ahead in applying gene therapy to other potentially more challenging forms of retinal dystrophies; however, the tools are now available to tackle a number of these diseases. The work to date provides hope for patients with inherited retinal dystrophies, and in the next decade it is anticipated that novel therapeutic strategies will be developed for a number of these genetic defects. Age-related macular degeneration (AMD) is a common disease caused by genetic and environmental influences. The most important lifestyle risk factors associated with AMD are smoking and obesity. Genome-wide association studies have led to a major breakthrough in the AMD field, with the identification of strong association with common variants in complement factor H (CFH), the main regulator of the alternative complement pathway. Subsequently, also SNPs in other complement factor genes have been associated with AMD: complement factor C3, complement factor B (CFB) and complement factor I (CFI). 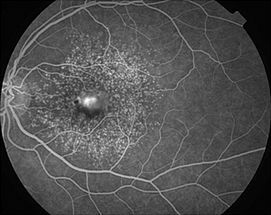 Drusen, the hallmark lesions of AMD, are pathological deposits of extracellular material formed between the retinal pigment epithelium (RPE) and Bruch membrane. Complement components C3 and C5, the membrane attack complex C5b-9 and CFH are constituents of drusen. Recent studies have demonstrated complement activation in serum of AMD patients, suggesting that AMD is actually a systemic disease which only manifests in the eye. The second major genetic risk factor for developing AMD was identified at the chromosome 10q26 locus. Controversy remains as to which gene at this locus is responsible for the high risk of developing AMD, as SNPs in Age-Related Maculopathy susceptibility 2 (ARMS2/LOC387715) gene and the adjacent high-temperature requirement factor A1 (HTRA1//PRSS11) gene are in high linkage disequilibrium. A recent study suggests that both ARMS2 and HTRA1 could be involved in the pathogenesis of AMD. The function of the ARMS2 protein remains unknown, and controversy exists about its subcellular localization. Recent genome-wide association studies in large cohorts of AMD patients and control individuals confirmed that CFH and ARMS2/HTRA1 are the most important genes involved in AMD, though it is plausible that variants in many other genes may have small effects on the development of AMD. For example, it has been demonstrated that genetic variants in several constituents of the cholesterol pathway can modulate susceptibility for AMD. Figure 2: Typical fluorescein angiogram of a patient with advanced drusen maculopathy resembling basal laminar drusen. Note the typical “stars-in-the-sky” appearance, with central confluence of drusen and the small pseudovitelliform pigment epithelial detachment. Figure 3: Recessive inheritance of CFH variants in families affected with basal laminar drusen. What is the role of ARMS2 and/or HTRA1 in the development of AMD? Are there clinical subtypes of AMD? And can rare genetic variants rather than common variants underlie these subtypes? In line with this hypothesis we recently showed that mutations (rather than common variants) in the CFH gene can cause basal laminar drusen (Figures 2 and 3). Why do 10 to 20% of patients with neovascular AMD not respond to therapy? Which genes or factors determine the rate of progression of AMD? Genetic studies have not only enabled researchers to understand the pathogenic mechanisms underlying AMD, but also provided therapeutic targets to prevent the disease in the future. Pharmacological modulation of the complement cascade is currently being investigated as a therapeutic strategy for AMD, though further research is warranted to have a better understanding of the proteins that can be safely inhibited and those that cannot.